Bring one pot of salted water to a boil. Prepare a bowl of ice water to shock the peas after they are finished cooking (the ice water will stop the peas from further cooking and becoming over-cooked). Once the water is boiling, throw the peas in for one to two minutes (until they are tender but not mushy: they will float when they are finished). Pull the peas from the water and place in the ice bath. When completely cooled, pull from the bath (you don’t want them to get watery). In a saute pan, warm up a few tablespoons of olive oil. Cut your red onion in half and then slice the red onion and place in the saute pan. Monitor the heat so you do not fry the onions – you want a low saute. Onions should be very pliable and slightly translucent. Start to prepare the pizza dough. Smear the dough with olive oil, until it has a clear coat on it, and season with salt and pepper (to taste). 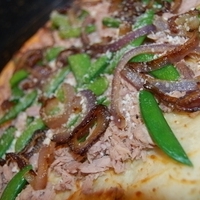 Scatter the drained tuna, sauteed onions and peas all over the pizza. Cook pizza in a 450 degree oven for 10 minutes. Crust should be slightly golden brown. Great idea for a pizza! Never would have thought to use canned tuna! You get my 5! I used to make tunafish pizza in the 70's! and I know how good it is. I also made a variety of different toppings which today are in but back then, people just looked at me funny!! This looks awesome... a winner for sure! Being me, I'd throw on some broccoli and mushrooms too ;).